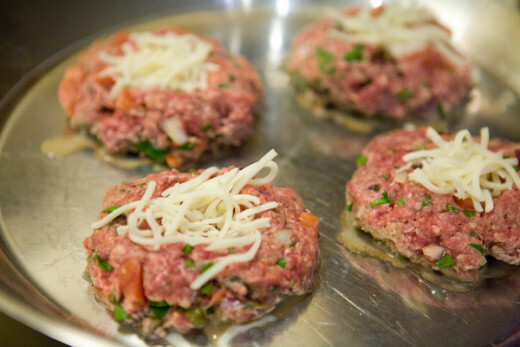 These Mozzarella Stuffed Burgers are the most asked for burger recipe in our home! While there's a little more prep work than most burgers, your mouth will thank you as you bite into this gourmet burger! 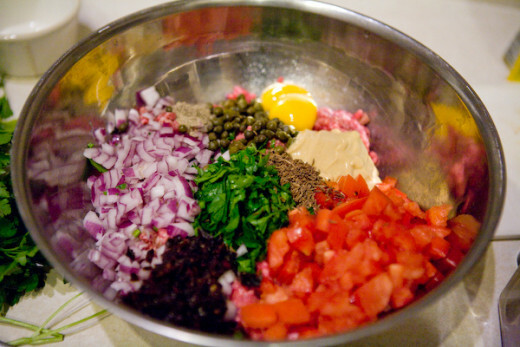 The Dijon mustard, capers, sun-dried tomatoes, and caraway seeds, as well as the red onion and Roma tomatoes, add some unique dimensions to the flavor. The hint of mozzarella hidden in the center is icing on the cake for this stuffed hamburger recipe. Whether you grill the burger at your next family cookout or cook it on the stove-top or under the broiler, this is sure to be a burger recipe that delights your tastebuds! Even the kids will love it! Mine do! If you're one of the many who have chosen the Paleo lifestyle, this recipe is perfect for you with one small change - simply omit the mozzarella cheese! 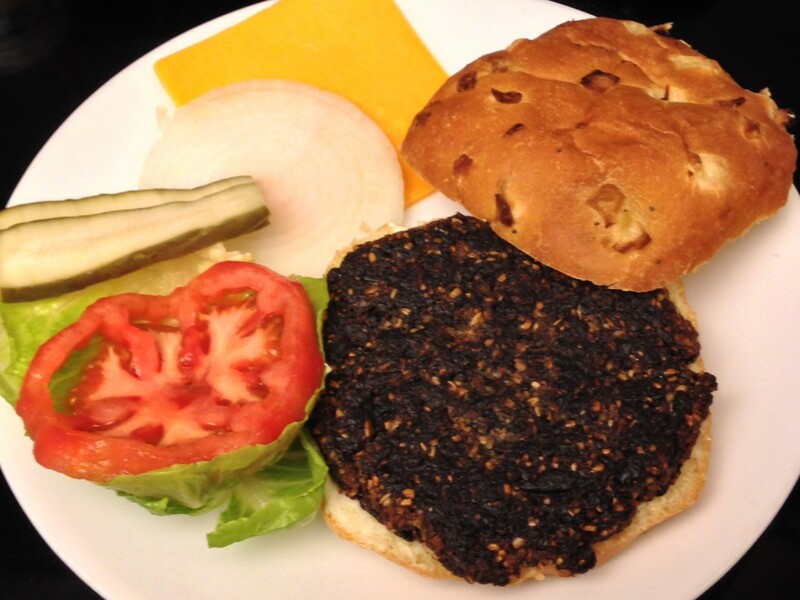 Serve on top of a bed of lettuce and top with a tomato, and you have the perfect Paleo Burger for your lunch or dinner. Capers are the unripened flower buds of the plant Capparis spinosa, also known as Flinders Rose. 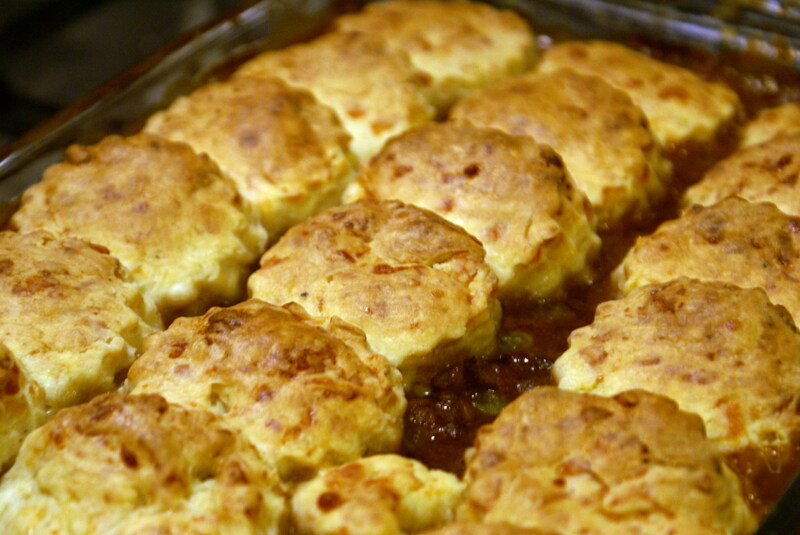 The smallest size, used in this recipe, come from Southern France. They are very salty so no additional salt is added to this recipe. Combine all of the ingredients, except for the cheese, in a large bowl and gently mix together with your hands. Divide the mixture into two equal halves. From each half, make four (4) patties. 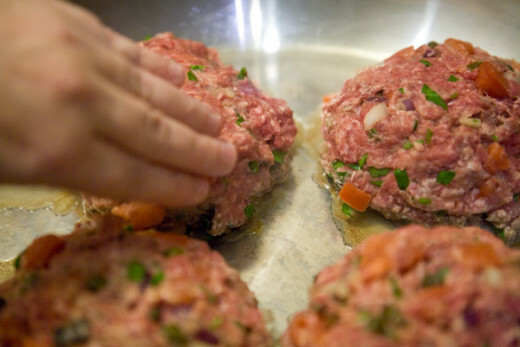 With your thumb or finger, make a small indentation into the center of the patty. Place about 1 tablespoon grated mozzarella cheese into the indentation. 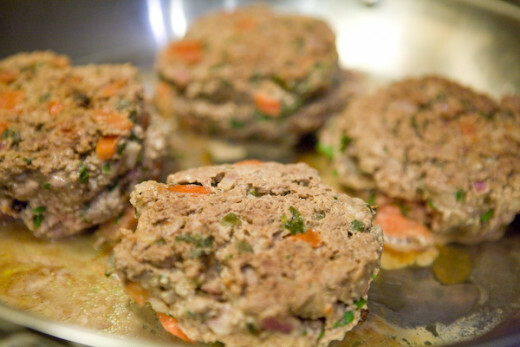 Take one of the remaining patties and place on top of the half you just stuffed with cheese. Press edges together. Grill over hot coals for 3-4 minutes on each side for rare, or longer to taste. The step-by-step directions below are accompanied by detailed photographs to help you make this delicious hamburger recipe. 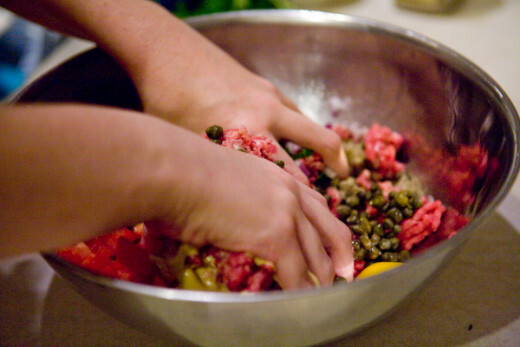 Using your fingers, gently separate the ground beef and place it in a large bowl. Some meats may be easier to separate than others. 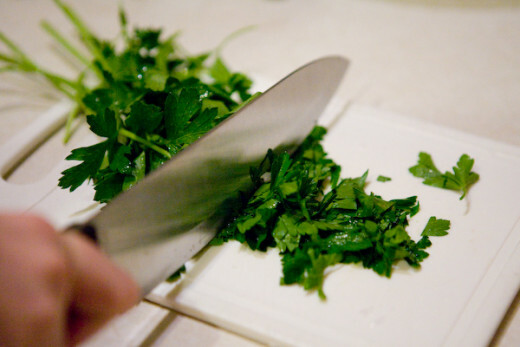 Take a handful of Italian flat leaf parsley from a bunch and chop it finely. Measure out 1/2 cup and add it to the meat. 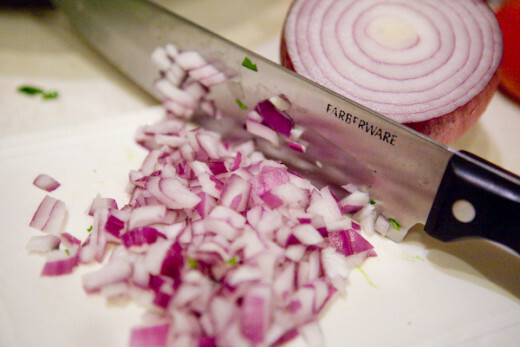 Next, take a medium-sized red onion and cut approximately 3 to 4 slices. Dice the slices to about 1/4 inch pieces. Measure out 1/3 cup and add it to the meat. 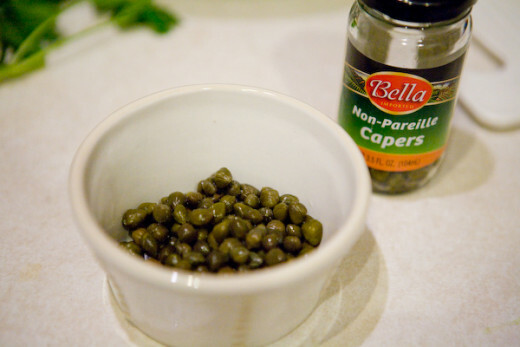 The capers I use are non-pareille capers. These are the smaller sized. Do not use the large sized capers for this recipe, if at all possible. Drain the capers reserving the liquid. Measure out 1/4 cup and add to the meat. Pour the liquid back into the jar to keep the remaining contents preserved for other uses. 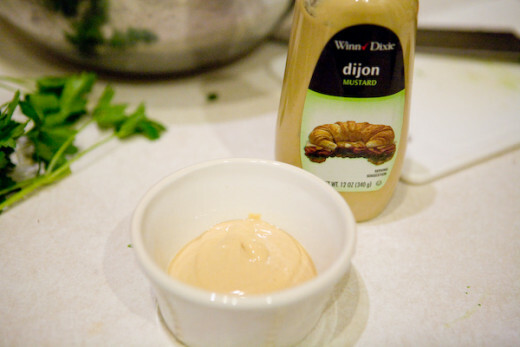 Using your favorite Dijon mustard or other spicy mustard variety, measure 1/4 cup and add it to the meat mixture. 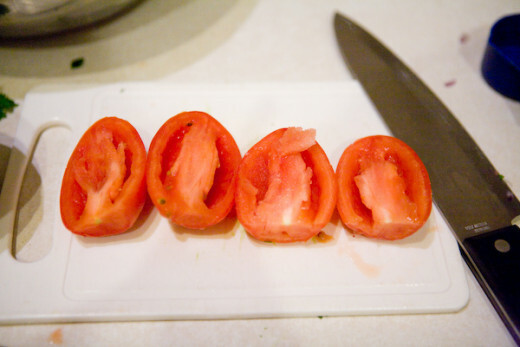 Cut the Roma tomatoes in half lengthwise. Using your fingers (or a spoon), run your finger along the seed membrane to loosen and remove it. Do this for all four halves so that no seeds are present. Cut each half into slices and chop into 1/4-inch pieces. Add this to the meat mixture. This recipe requires egg yolks to help the meat stay together. Separate the egg whites from the yolks. 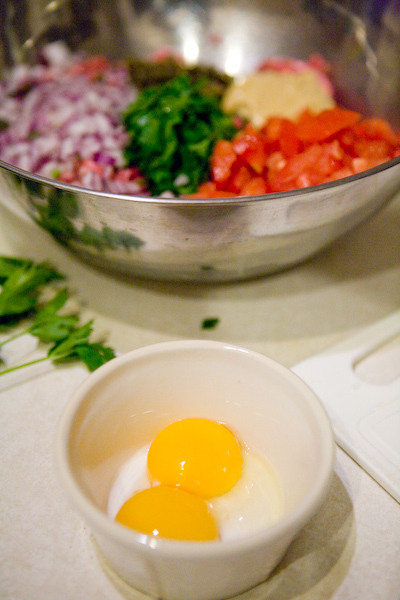 Add the egg yolks to the meat mixture. The sun-dried tomatoes add a little extra flavor to these burgers. The bag can usually be found in the produce department near the tomatoes. Take four (4) pieces from the bag and place on cutting board. Each piece would equate to 1/2 a tomato. 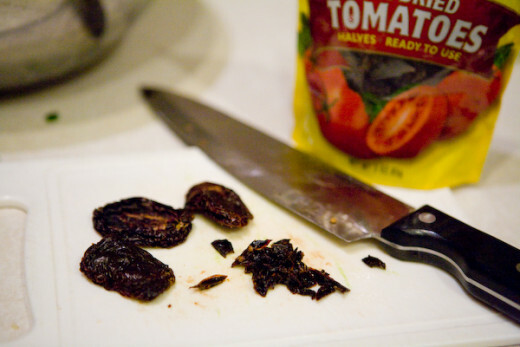 Cut the tomato pieces into strips and then crosswise to get a fine chop. Add these to the meat mixture. 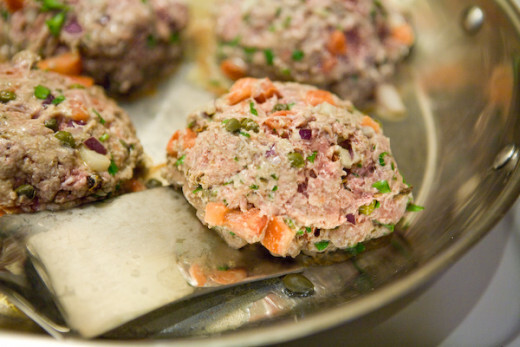 One of my favorite flavors in these burgers are the caraway seeds. They add that unexpected little taste in each bite. 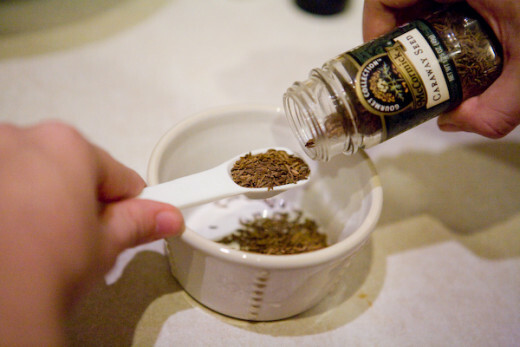 Using your measuring spoon, measure 2 teaspoons of caraway seeds. 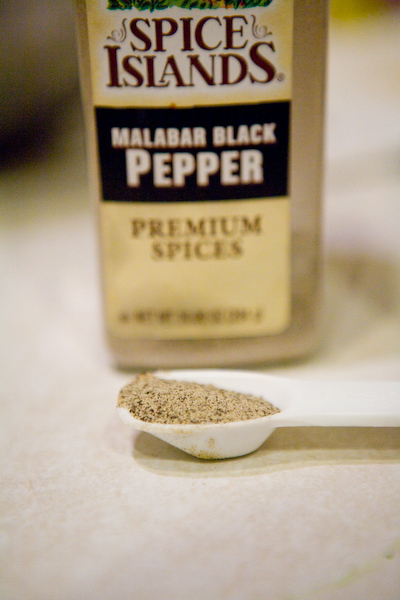 Using the same measuring spoon, fill 1 teaspoon with ground black pepper. 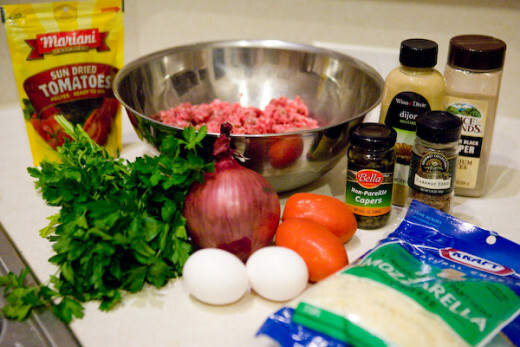 Add both ingredients to the meat mixture. Your meat mixture will now look like a colorful collection of food items. Doesn't it look delicious? Using your hands, gently knead and mix all ingredients together. 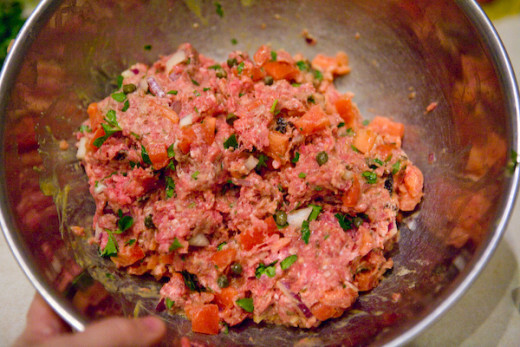 The meat mixture should appear well combined before going on to the next step. 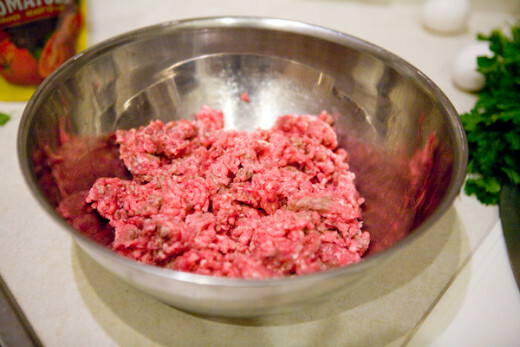 The combined meat mixture can be separated into two halves. From each half, you will need to create four (4) patties. Using your hands, form the patties and shape the edges so they're round. 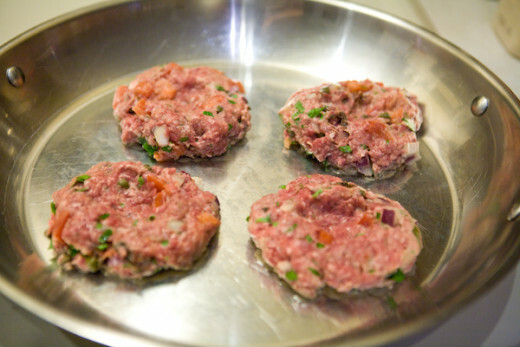 Four patties will be used as the base of the burger, and the remaining four will be the toppers. 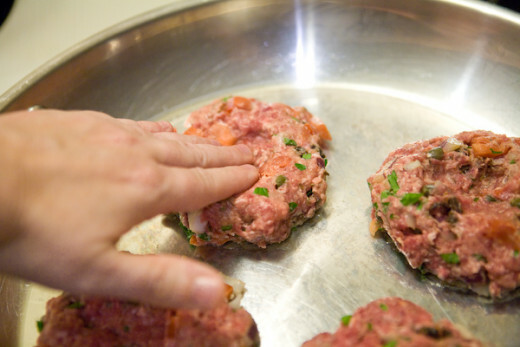 Using your fingers or a spoon, gently create an indentation into the center of the four patties. 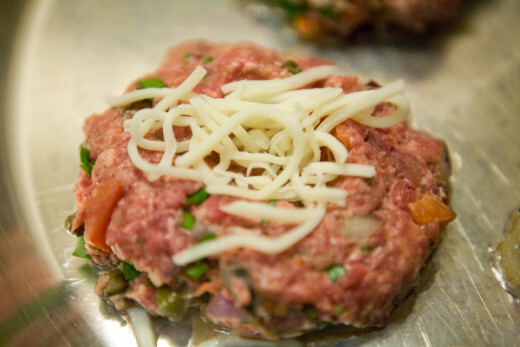 Take approximately 1 tablespoon of grated Mozzarella cheese and add it to the center of one of the patties. Repeat with the remaining three patties. Take the four remaining patties (toppers) and place them on top of the ones with the cheese. Using your fingers, crimp the edges together to form a pocket for the cheese. 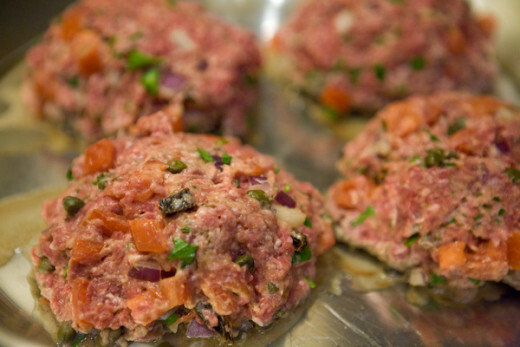 The patties will look huge, but it's because they have a lot of great ingredients that bulk up the patties. We don't currently have a grill, so we cook our burgers indoors on the stove top. You can also cook your burgers under a broiler. 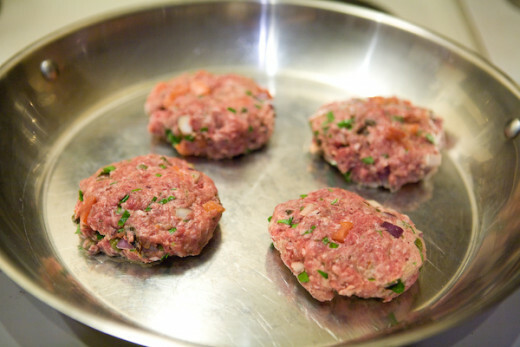 For the grill or stove top cooking method, place burgers over medium heat and let cook for about 4 minutes. Carefully, flip the burgers over using a sturdy spatula (these burgers tend to be a bit heavy). Cook for an additional 4 minutes. This amount of time is approximately equivalent to a rare to medium rare burger. Cook longer, if needed, to meet your own preference in meat temperatures. The burgers may show some separation during the cooking process if they weren't crimped well enough. They shouldn't fall apart, though. Whether you choose to eat your burger with a toasted bun or without a bun at all, your taste buds are in for a delicious and savory meal! 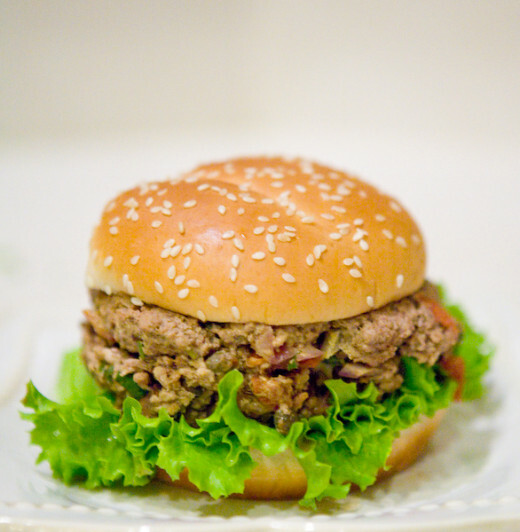 Nutrition facts are based on 93% lean meat and does not include dietary information for the bun. All photos copyright 2012 Keely Deuschle. All rights reserved. Do not copy images. 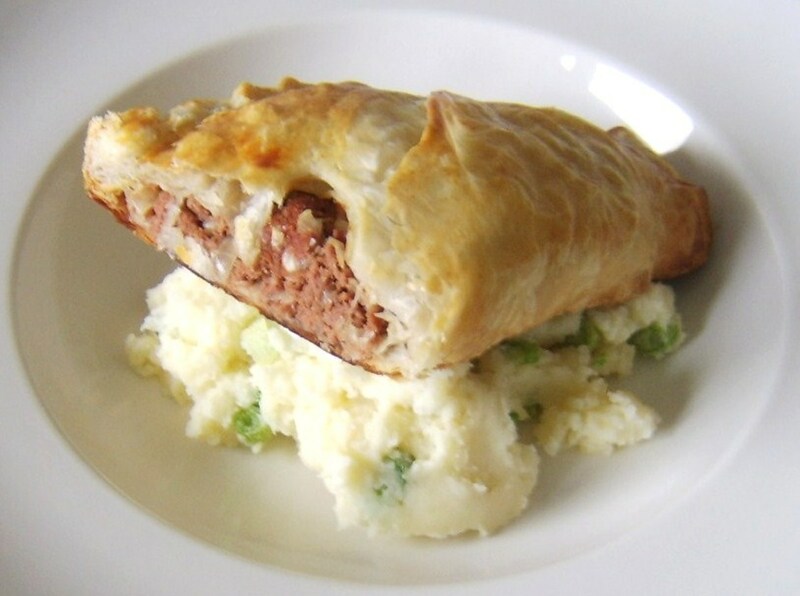 Australian Sausage Rolls - Delicious savory with a bit of sweet meat-filled rolls that can be made with either ground sausage, ground beef, or even ground turkey. 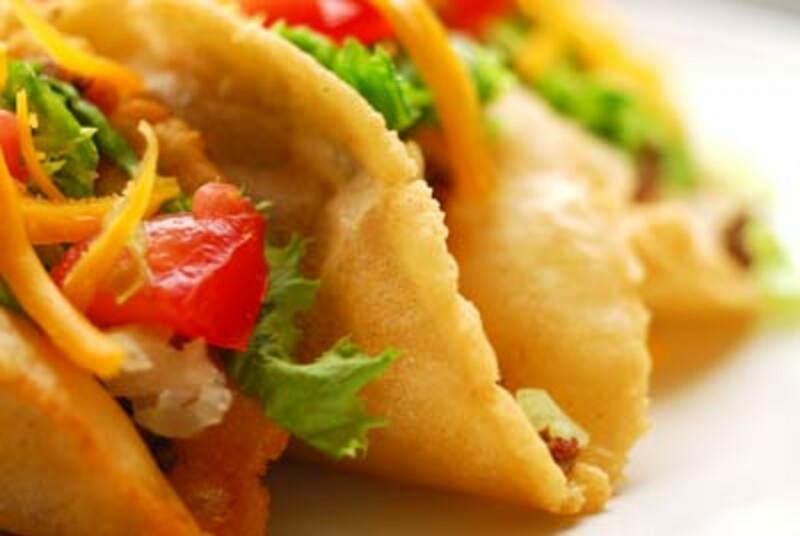 Delicious as beef appetizers or as a main meal. Polish Galumpki (Stuffed Cabbage) - Delicious meat and rice combination stuffed inside cabbage leaves - a delicious recipe that tastes delicious even as leftovers! Chinese-Inspired Meatloaf - An Asian twist on a traditional meatloaf recipe! Thank you for sharing your suggestions! Yes! I love substituting the mozzarella with either Feta or Bleu cheese. I switch it out from time to time! I know you like to make this with mozzarella cheese but have you ever considered using a more exotic cheese like Feta or Blue Cheese? I like all the "extra flavorings" you have added to the meat. Also, the 93% Lean meat is a nice touch. I always tell people to use 93% Top Sirlion. It is so much healthier than 80/20 Chuck or Round. Wow this looks mouth watering! And thanks for adding the nutritional info too!! This recipe makes me yearn for summer days and a nice afternoon BBQ! Thanks for commenting, Suzy! I hope you get a chance to try it! Let me know if you do! This is a great step by step guide and the burgers look so appetizing on the photos so I must try it soon! Hi Victoria Lynn! Yes, the flavor is indeed awesome! I love the combination of all the unique flavors! Thank you for pinning it. Enjoy! Oh, yum! Those are some excellent ingredients. I'll be the flavor is awesome. 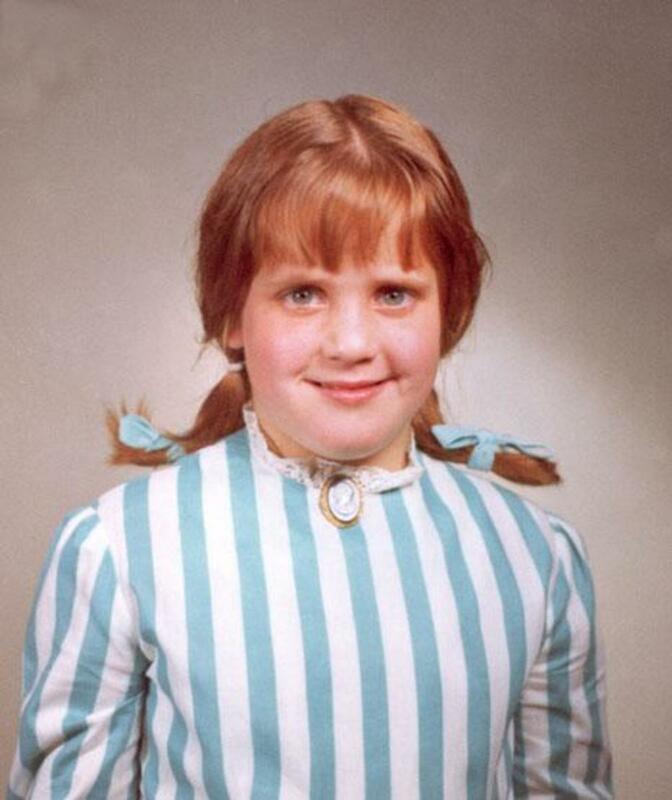 I'll have to pin this to my recipes! Thank you, teaches! 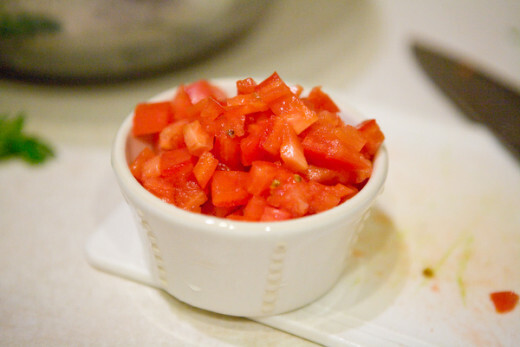 I love the taste that both tomatoes give as well as the capers and caraway seeds! When you try it, let me know what you think! Thank you for sharing and voting up! If ever there was a perfect hambuger, this would be it! What a beautiful photo! I love all the ingredients you listed for this, especially the fresh and dried tomatoes. I think this gives the recipe a sweet full flavor. You know I will be trying this soon. Voted up shared! Thank you, Kasman! Food is one of my favorite topics, too! If you try this, drop a line to let me know if you enjoyed it! Ok, very detailed front to back recipe on one of my favorite topics....food. Voting up. Great piece! Thank you for your comments! I hope you enjoy it! These look absolutely delicious! I have been craving for some hamburgers lately so might as well make them at home. Thanks for sharing the recipe.